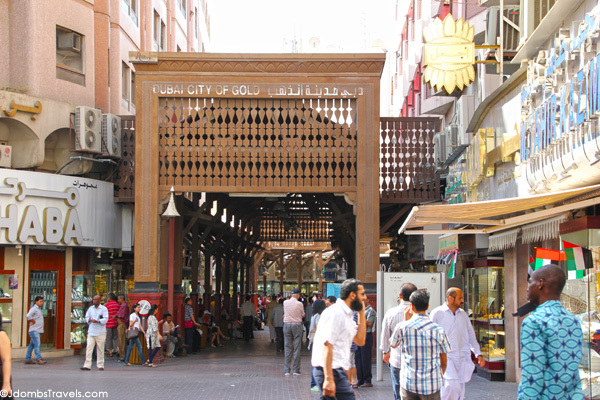 Dubai Gold Souq is one of the famous places in Dubai. It is located in the Dubai’s commercial district in Deira, in the locality of Al Dhagaya; hence it is also called the “Deira Gold Souk”. It consists of over 300 jewelers on site to accommodate all your gold related needs including both well established stores like Damas, ARY Jewellery and Shyam Jewellery as well as smaller ones that operate only in the gold souk. Whether you are looking to buy or just peruse, the Dubai Souk is worth your visit. It is estimated that approximately 10 tons of gold is present at any given time in the souk in the form of bracelets, necklaces, rings, diamonds, emeralds, rubies, sapphires and more, making the Gold Souk one of the most popular tourist stops in the Middle East. Address: Off and around Sikkat Al-Khail Rd, Deira. Open: Saturday to Thursday 10:00 to 22:00, Friday 16:00 to 22:00. 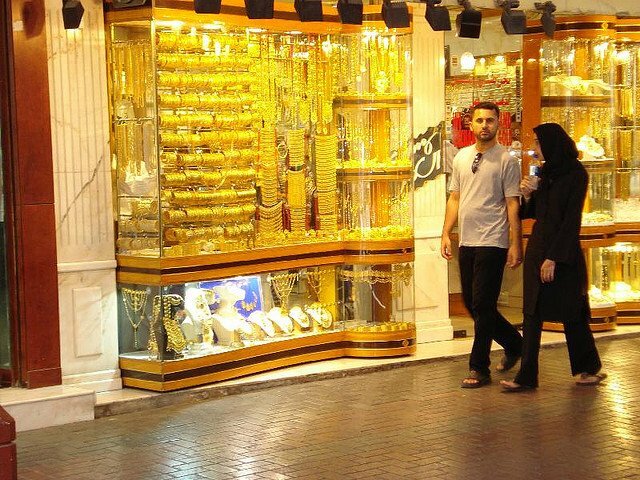 The Deira Gold Souk said to be one of the cheapest place in the world to buy gold. The government keeps strict control over the quality of the goods in the stores, so rest assured that any purchase made at the Dubai Gold Souk are genuine. However, It is entirely expected that you negotiate the price for any wanted goods, and if one doesn’t sound good to you, don’t be afraid to keep exploring. 1- Check the gold price: As gold rates change constantly, it is recommended to check the gold price in the souk or in the hotel just before going to the souk. Check the gold prices from more than one source, including this site at the page of Gold Price in Dubai. 2- Be close to the stores located inside the souk and better select one of the famous stores like Damas, ARY Jewellery and Shyam Jeweller. 3- When you choose your piece, ask about karat and the price and check with your prices. Two karats are mainly available in the souk; 24 karat which is almost 100% pure gold and 22 karat. In addition to the gold price, there is also the craftsmanship price which is the area in which you can negotiate. Some say it is typical to be able to barter to up to 30% of the quoted price. And the more pieces you are buying, the more bartering power you will have. 4- Shop around and compare prices between retailers. where is the best place to sell, and they buy on screen price? we can buy in Germany , LME Price – 5% net , 24 karat . Payment 4 Day after Assay completed to Bank account . How much of the quantity of gold i have to buy there from and will take in india as without any custom charges?